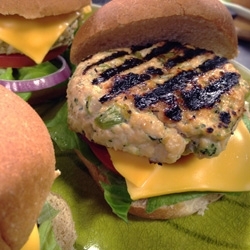 Here’s a clever way to add more veggies to your plate: mix frozen chopped broccoli right into your burgers. This recipe also offers up a double shot of bone-strengthening calcium from the broccoli and cheddar cheese. In large bowl, mix together ground turkey, cooled broccoli, egg whites, ketchup, mustard, and garlic powder with hands until blended. Form burger mixture into six medium-sized patties. Preheat large griddle over medium-high heat (or preheat grill pan or outdoor grill). Coat grill/pan with oil spray and add burgers. Cook 5 to 7 minutes per side, or until burgers reach an internal temperature of 165 degrees. During the last few minutes of cooking, top each burger with a slice of cheese. Place each burger on a bun, if desired, and layer with the optional toppings. *May substitute lean ground sirloin in place of ground turkey.